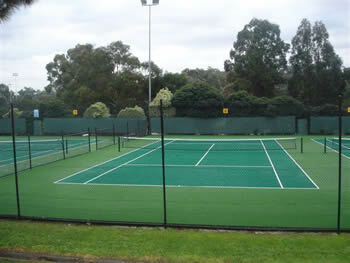 Currawong Tennis Club boasts six newly constructed tennis courts (April 2009). The surface is "commercial Grand Prix" designed for our club to give it a dynamic performance. Being made of S & Z twist yarn makes the Grand Prix surface very grippy underfoot and subsequently more responsive to slice and top-spin. Being short and dense means that there is not a lot of sand required and as such the courts look fantastic. Like all surfaces Grand Prix is UV stabilised to meet the extremes that the Australian climate presents. In the wetter months, our tennis courts can be played on immediately after rain due to the drainage capabilities of the surface.